Mike Francesa’s relationship with Fox Sports 1 has been about as functional as a couple that finds true love with one another on The Bachelor. Yes, there’s a very public courting period and sparks flying at the thought of romance, but once the lights go out and the relationship actually begins you both realize you really want nothing to do with each other. That last part is the domain in which Francesa and Fox currently reside. And unfortunately, for Francesa especially, things are going to get much worse before they can get better: a.k.a. the day his contract with Fox finally ends or they can mutually part ways. On Wednesday Fox finally unveiled sports radio provocateur and amateur sociologist Colin Cowherd as their newest hire. The network finally announced that Cowherd’s new radio show will air from 12-3 PM ET on Fox Sports 1 and Premiere Radio. Of course, that’s currently Francesa’s slot on Fox Sports 1. So the sports pope has to deal with the ignominy of moving to Fox Sports 2 permanently and playing second banana to Colin Cowherd’s latest rant about John Wall and how he’s too progressive and open-minded to not really be racist. How do you think Mike Francesa feels knowing that he has to be behind Colin Cowherd in the Fox pecking order? Forget his simulcast constantly being preempted, he’s not even the most important simulcast at the network anymore! Calling Fox Sports 2 a barren wasteland is putting it nicely. The network still isn’t in HD for a lot of consumers that even have the channel, let alone all the ones who don’t. 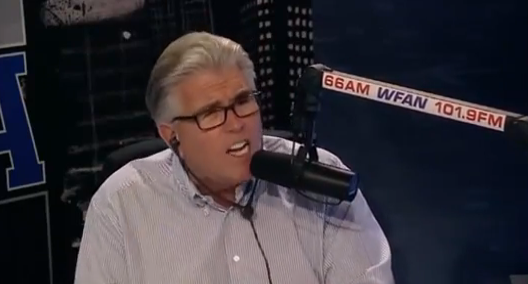 Why do you think Francesa is always so frustrated and flustered when he gets preempted from FS1? Because Francesa averaged 6,000 viewers on Fox Sports 2 a couple weeks ago and the channel only averaged 25,000 total day viewers. Moving forward, on those days when there is a must-see live event in the afternoon and Cowherd goes to FS2, this new schedule means Francesa will be bumped from television entirely. Francesa has never shied away from publicly criticizing Fox Sports 1 in the past. Now that the network has basically given him a demotion to make way for Colin Cowherd, the next time he’s at the microphone should be appointment viewing. If he’ll actually be on television, that is….